Standard length of the project, based on 1 EC = 28 hours. This includes time to write your report and to prepare your presentation. 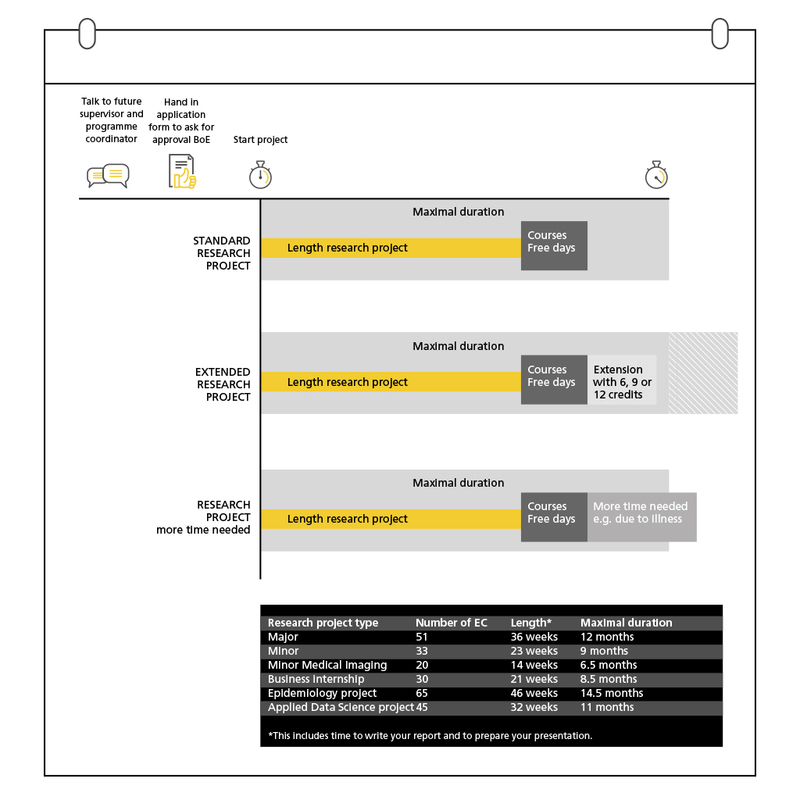 The minimal duration of your research project is in the table under 'length'. If you calculate the duration with this number of weeks, all days spend on holiday or courses should be added to the end date. During your project we estimate there will be approximately three weeks spent on regular days off, time while you wait for your assessment and holidays. Therefore, while planning your programme take into account that in practice a major research project takes 9 months (39 weeks) and a minor research project 6 months (26 weeks). Furthermore, time spent on courses should be added to the duration of the project. In all cases your research project needs to be finished within the maximal duration. This includes handing in your report and presenting your results. This does not include the 10 working days for assessment by your examiner and second reviewer. You can only extend your research project with 6, 9 or 12 credits. Apply for an extension before the start of your project. This can be pointed out on the application form. After you started your project, it can only be extended for credits in exceptional cases. Apply for this extension by sending a formal request to the Board of Examiners, signed by your examiner and programme coordinator. Do this well before the start of the extension. Extra credits will not be granted if you need more time to complete your project, for example due to failed experiments or problems during the analysis or writing phase. Examiner/supervisor needs more time due to personal circumstances. If the new end date falls within the maximal duration of the project, informing the research project coordinator is not necessary. A request to exceed the maximal duration of the research project has to be submitted at the research project coordinator before the maximal duration is exceeded. Personal circumstances for which you contacted the academic counsellor during your research project. Your request should be supported by the academic counsellor. Gathering more data, better results, new insight within the research group, inclusion, DEC or METC and other matters concerning day to day practice in research are not considered valid reasons.